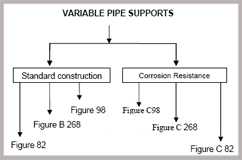 Variable supports used for piping subject to vertical movement where some change in the supporting effort with change of position is acceptable. 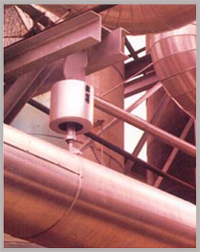 Variable Supports are recommended for general use on non-critical systems where vertical movement is of small magnitude, typically up to 50mm.Accepted practice is to limit the amount of supporting force variation to 25% of the hot load for critical system applications. Radcoflex Variable support is manufactured in 3 figure numbers & seven types, and is offered in 21 sizes. The support can be furnished to take loads from 0.22 to 125 Kilonewtons. • Saves up to 50% in headroom by reducing the length of the support. • Reduces the overall height of the support assembly. • Spring deflection indicator is clearly visible from both sides of the support. • Corrosion resistant construction model is supplied with a bolted closure providing access to the spring for maintenance purposes. • All models fitted with travel stops and factory preset spring deflection. This saves on site erection & commissioning time. • Support casting has been designed to permit drainage of water and to protect spring from damage. The type of variable support to be used depends upon the physical characteristics required by the suspension, i.e. amount of headroom and whether pipe is to be supported above the spring or below the spring.Consideration should be given to the seven standard types offered, type A through to G.Special variable support can be fabricated for unusual conditions. • Type A is designed for attachment to a structural member by screwing a rod into a tapped hole for the full depth of the top cap. • Type B is furnished with a single lug for attachment to the building structure. The lug permits use of a welded beam attachment, clevis or a pair of angles for attachment. • Type C is furnished with a single lug for attachment to the building structure. These two lugs permit the use of eye rod or structural welding lug for attachment where headroom is limited. • Type D is especially adapted for use where the support is set above the supporting structure and pipe is suspended below. It permits adjustment of the support from the top. • Type E is designed to permit adjustment from either above or below the support, when it is installed upon the supporting structure and pipe is suspended below. A coupling tapped right hand both ends is furnished. • Type F is recommended where the support must be located below the load. Where horizontal load movements in excess of 6mm are anticipated, consideration should be given to replacing the optional load flange with pipe roll or a sliding support comprising a Rulon pad in contact with a stainless steel plate.